BUTTE MONTANA Vending Machine Companies! 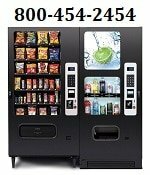 Offering FREE Vending Machines: Snack, Soda, Coffee, Deli, Drinks, Food, Frozen, Healthy Vending, Micro Markets, Amusement Games, & Repair services for your employee breakrooms. Please contact these vending machine operators directly for more information about their vending products and services. Montana Vending Inc – Contact Ken Jonasen. Vending Snacks, Candy, Office Coffee and repair services. Our vending service company is based out of Black Eagle, MT.